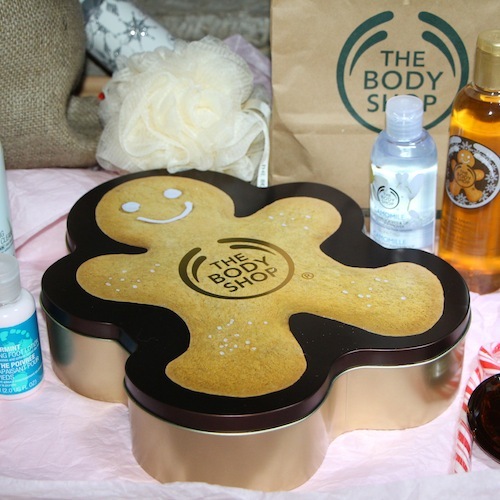 More photos from the fireside; this time it’s a few nice gift ideas using bits and bobs from The Body Shop*. I don’t mind a pre-prepared gift, but I must say that I quite enjoy putting together my own packages so that I can pick out my favourite items and customise things a little. But on with my handpicked presents. 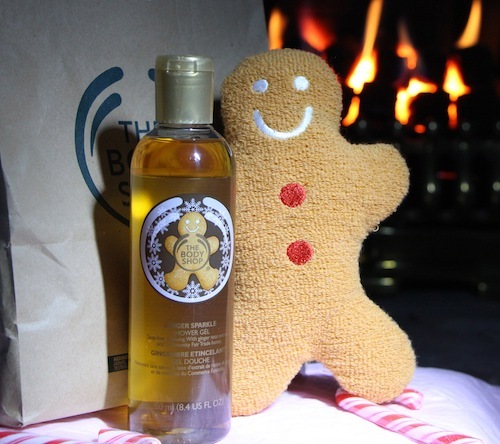 Number one (above) is festive and cheerful and comes in at a very nice price: £2 for the gingery shower gel (here) and £1.75 for the cheerful Gingerbread man sponge. Number two is my “retro collection”. Banana shampoo, Satsuma Puree (not properly retro, but smells amazing!) and the Peppermint Cooling Foot Lotion. I’ve wadded out this present with one of those pouffey bath things – annoying, but brings it all together nicely. 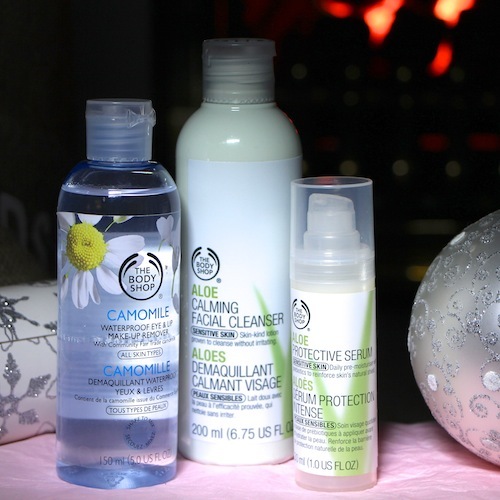 Next, a skincare grouping that I find very pleasing: gentle and effective products that will suit most skins. I love the Aloe cleanser and I use the Camomile Waterproof Eye Makeup Remover a lot – the serum is a new one for me, but came highly recommended by a friend. Total cost for this combo? £13.50 in the sale. Next, my Honey Bronze set – a brilliant shimmering gold body oil paired with one of the best pale bronzers I’ve come across. I use my bronzer all the time, so much so that I’ve bought a new one, a shade lighter for the winter months! The one above is shade 2 (here) and the total price of the honey gift is £10.75 with the sale discount. I love this – it would make a great biscuit tin, don’t you think? Inside you get a shower gel, scrub, heart soap and a little body butter and they all smell wonderful. Very spicy and warming. Price of this set? £17.50 or £8.75 in the sale. It’s here. The code for the 50% discount is on the homepage here. *this post has been sponsored by Rakuten – some products are samples, most have been purchased. Next Post Things We Would Gladly Receive, Ta Ever So.